Saving a search template allows you to use an already customized search template again and again. It can be further customized and renamed for other uses. When saving a search template you can give it any unique name you want. When you have a search template with the desired fields in the desired criteria containers with or without values in the fields, you can save the template by hovering over Save Search. This will save a search template, a search template with criteria in some fields, and save a specific search for a customer. When you save a search for a customer and associate or tie that search to that customer in the Contact Manager, it starts the auto – search process. You can also save a search to a customer in the Contact Manager module. Save Search allows you to update an existing search template with new fields and/or data. Save Search As allows you to give a new template or search a name. These steps are to save a new search template as your default template. 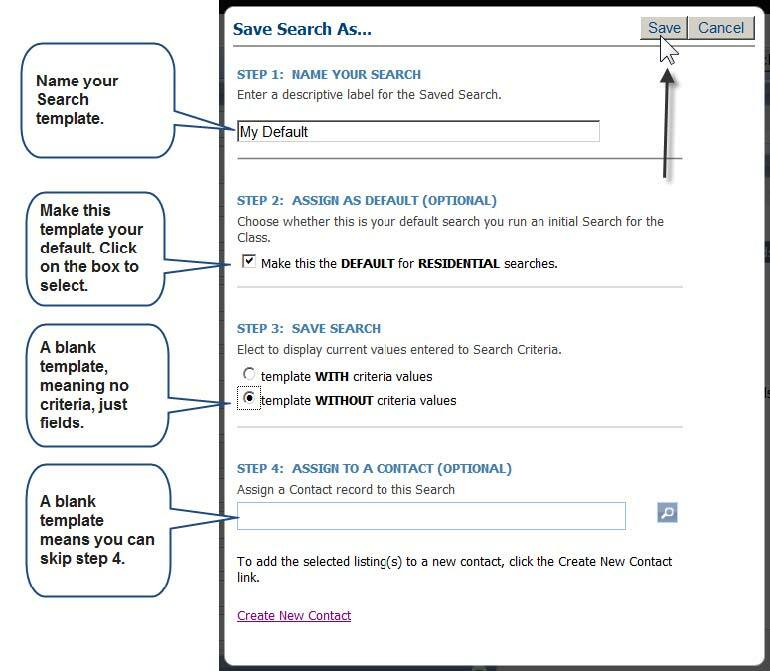 If you were to save a search with criteria for a customer, step #1 still name your search, #2 do not do step, step 3 would be template WITH criteria values and then in step 4 assign this search to a customer to start the auto – search process.